During our NeuroCare Campus expansion in 2012, we had to remove our flagpole during the new building construction and campus landscaping. It was carefully set aside for later re-installation. 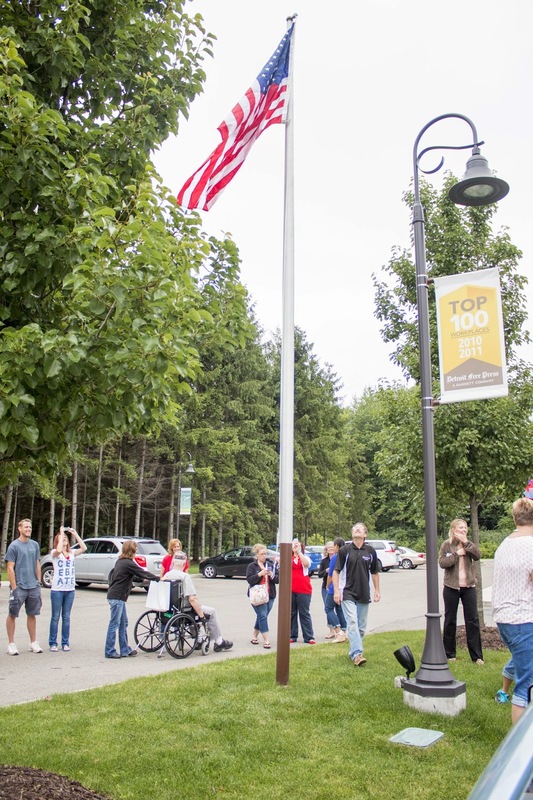 Today, July 3, 2014, Vice President and Director of Referral and Admissions Jack Richert led a ceremony to raise the flag once again, now in its new home in front of the main campus entrance outside of NeuroCare North. Jack thanked the men and women who serve our country, especially in times of war, as clients, staff and visitors were at attention, hands over hearts, as the star spangled banner played in the background and the flag was officially raised for the first time. The flag is now flying high once again at Special Tree NCC. Independence is something we like to celebrate in ways big and small all year long with and for our clients, so it is fitting to raise the flag as part of the Independence Day holiday - perhaps our favorite holiday of the year! Have a safe and happy July 4th weekend.